As parents of young children, one of the trickiest things we do every day is trying to get our families to not only eat but to eat the "right" foods. Should you follow the food groups? Count calories for little ones? How do you know your child is eating what they should? 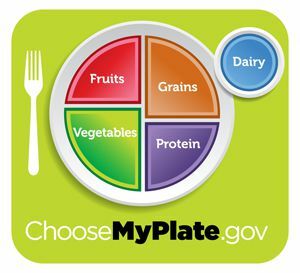 Enter MyPlate from the U.S. Department of Agriculture, a color-coded place setting designed to help people visualize the foods they should be eating. While the USDA has been publishing some type of nutrition guidelines for over 100 years, it was in 1992 that it introduced the Food Guide Pyramid as a way for people to make good food choices. The pyramid was divided into six horizontal sections and showed pictures of the foods in each group depicted. Alongside each illustration were guidelines of how many servings of each food should be eaten each day. The pyramid was updated in 2005. Called "MyPyramid," it featured vertical stripes of varying widths, once again designed to demonstrate how much of a particular food group consumers should be eating from each day. Each food group had a different color. Still, there were complaints from many that MyPyramid, while an improvement on the first incarnation, was confusing and didn't adequately explain what and how much people should be eating. With MyPlate, the graphics indicate how a person should spend their "food budget" each day — approximately 30 percent in grains, 30 percent in vegetables, 20 percent in fruits and 20 percent in protein. A small circle represents dairy. What Should Be On Your "MyPlate?" Ultimately, the goal of the new MyPlate is to help Americans have a balanced diet while reducing obesity, both in children and adults. "This is a quick, simple reminder for all of us to be more mindful of the foods that we're eating and as a mom, I can already tell how much this is going to help parents across the country," said First Lady Michelle Obama at a press conference unveiling MyPlate. "When mom or dad comes home from a long day of work, we're already asked to be a chef, a referee, a cleaning crew. So it's tough to be a nutritionist, too. But we do have time to take a look at our kids' plates. As long as they're half full of fruits and vegetables, and paired with lean proteins, whole grains, and low-fat dairy, we're good." Still, many parents are confused. "I understand my daughter needs to eat fruits and vegetables," said Justine Miller, mom to 4-year-old Bella. "But do I have to follow what the plate says for every meal? What about snacks? It just seems too vague. I liked the pyramid because there were concrete examples." “When I first heard about the plate coming out, it made sense to me that perhaps it would be more realistic and ‘food-like’ and people could relate to it," said Dr. Kathy Keenan Isoldi, RD, an assistant professor in the department of nutrition at the C.W. Post Campus of Long Island University. "But then when it came out with just the blocks and the words Fruits, Grains, Vegetables, and Proteins, I was a little disappointed – I was hoping for a design with a little more ‘reality’ to it, like a plate of beautiful healthy food. But I know what they wanted to do was to leave it open to interpretation." Dr. Isoldi says that she doesn't think the food on the plate necessary represents one day's worth of eating and she wishes they had shown that plate and then one with food on it. "It's just showing a traditional dinner plate," she said. "It's not even lunch or breakfast. I don't think the message is that people are supposed to eat that at every meal. You could, but that would be culturally different for us." One of the problems with MyPlate, Dr. Isoldi says is that we've gone from a complex message — a pyramid with different lines — to something that is very simple and people aren't quite sure what to do with it. "On the bright side, if we can get all people — and this certainly includes parents of children ages 2 to 5— to increase the amount of fruits and vegetables they eat, then we've made a good stride." Dr. Isoldi says, when it comes to feeding a young child, the key is to relax. "Kids that are in the 2-5 age group often have a reduction in appetite," she said. "There's a great growth spurt from birth to age two, but then the rate of growth slows down." What's most important is to make the most of what they are eating. Do not panic. You want to make sure there is a nice harmony in your house when it comes to food. If you have 'food fights' in your house when the kids are little, you'll have them when they are in their teens too. There should be no stress in the home around the meal. Desperate that all your little one will eat is macaroni and cheese or chicken nuggets? Remember that kids can go for long periods of time without all four food groups, especially if they are taking a chewable multivitamin five out of seven days of the week. Let them ride out a food jag. Get your kids involved in the process. Every study shows that kids who take part in the food preparation — whether it's going shopping or helping to make the meal — are more likely to eat. Get a chair or a stool and let them wash vegetables. Take them to the store and ask them what healthy foods they would like to eat. Allow "treat foods" — it's O.K. to keep ice cream and cookies in the house! But make it clear to your child that she can only have one a day. After that, if she wants another snack, it needs to be fruit or crackers or something else healthy. If you restrict certain foods, it will backfire when they are older. Talk about healthy food and what it's important. A 2-year-old can understand more than they communicate. Say, "Yay! Today we are going to make a healthy dinner!" Then ask if they want to help. Go slowly. Start with fruit rather than vegetables. And when you are introducing something new, just put a small amount on their plate. Remember that little kids have little tummies and they run around a lot. They do need to eat more frequently. Good snacks include peanut butter on crackers, ants on a log (although keep in mind that could be hard for kids three and under to chew), pudding (it's a little sweet but has calcium), fruited yogurts, Greek yogurt, reduced fat string cheeses and naturally low in sugar cookies such as vanilla wafers, ginger snaps, arrowroot cookies and graham crackers. Also good: yogurt smoothies made with half vanilla and half plain yogurt, frozen fruit (or fresh fruit and ice), milk and vanilla; or ice pops made from orange or apple juice.